Martin Hayter Short, CM is a Canadian-American actor, comedian, writer, singer and producer. 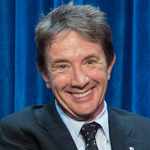 He is best known for his comedy work, particularly on the TV programs SCTV and Saturday Night Live. He has starred in comedy films, such as The Three Amigos (1986), Innerspace (1987), Father of the Bride (1991), Pure Luck (1991), Father of the Bride Part II (1995), Mars Attacks! (1996) and Jungle 2 Jungle (1997), and created the characters Jiminy Glick and Ed Grimley. He also won a Tony Award for Leading Actor in a Musical for the 1999 Broadway revival of Little Me.